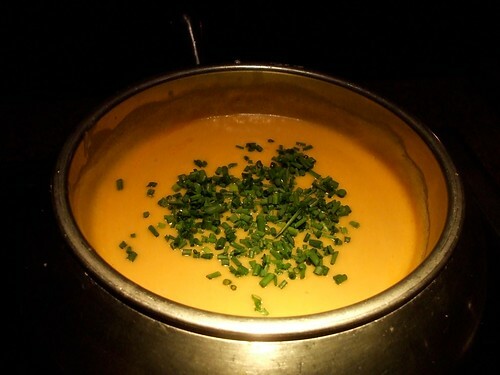 In honor of National Cheese Lover's Day (which for me is really every day), here's the recipe for my favorite fondue at The Melting Pot (one of the few chain restaurants I like). Toss the Butterkase and Fontina cheese with the flour in a bowl. Place a metal bowl over a saucepan filled with 2 inches of water. You may also use a conventional double boiler. Bring the water to a boil over high heat. Reduce the heat to medium and pour the white wine and sherry into the bowl. Stir in the shallots using a fork. Cook for 30 seconds, stirring constantly. Add half the cheese blend and cook until the cheese is melted, stirring constantly. Add the remaining cheese blend in a small amount at a time, stirring constantly in a circular motion after each addition until the cheese is melted. Fold in the pepper and Blue cheese. Pour into a warm fondue pot and keep warm over low heat. Garnish with the scallions.